like all metacarpals, actually are sinewy and have little to no associated muscle. “Pteranodon also inhabited this coastal environment during the late Cretaceous, making a living snatching smaller fish from the shark-filled waters. Pterosaurs could float, but being less buoyant than birds, they probably didn’t sit on the surface for long. Some species, including Pteranodon, did likely plunge into the water for prey. “They could then quickly take back off from the surface. But these diving pterosaurs might have been vulnerable to sharks just after they entered the water,” he says. 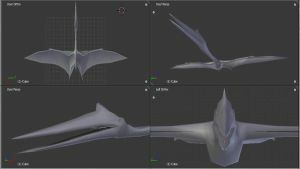 Figure 2 Triebold Pteranodon in floating configuration. Center of balance marked by cross-hairs. Pteranodon was at least as buoyant as a pelican. It has been widely known for over a century that pterosaur bones are thinner than bird bones and Pteranodon metacarpals, in particular, were hollow like pontoons (Fig. 2). the bite marks represent curiosity, not predation, a point understood by Ehret and Harrell. Ehret DJ and Harrell TL Jr. 2018. Feeding traces of a Pteranodon (Reptilia: Pterosauria) bone from the late Cretaceous (Campanian) Mooreville Chalk in Alabama, USA. Palaios 33(9):414–418. Earlier and below (Fig. 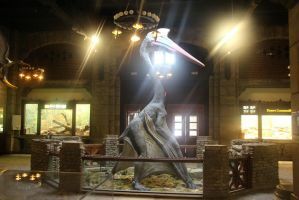 2) we looked at large and giant pterosaur wings comparing them to the largest flying birds, including one of the largest extant flying birds, the stork, Ciconia, and the extinct sheerwater, Pelagornis, the largest bird that ever flew. FIgure 1. A basal pteranodotid, the most complete Pteranodon, the largest Pteranodon skull matched to the largest Pteranodon post-crania compared to the stork Ciconia and the most complete and the largest Quetzalcoatlus. Note the much reduced distal phalanges in the complete and giant Quetzalcoatlus, distinct from the Pteranodon species. we’ll look at how the largest Pteranodon (Figs. 1, 4) compares to much larger pterosaurs, like Quetzalcoatlus northropi (Figs. 1, 2) that have vestigial wingtips similar to those of the much smaller flightless pre-azhdarchid, SOS 2428 (Fig. 3). on the wing of the largest Quetzalcoatlus, distinct from the more typical elongate and robust distal phalangeal proportions on volant pterosaurs of all sizes. Much smaller definitely flightless pterosaurs, like SOS 2428, shrink those distal phalanges, too. That’s the pattern when pterosaurs lose the ability to fly. Figure 2. A previously published GIF animation. Q. northropi and Q. sp. compared to Ciconia, the stork, and Pelagornis, the extinct gannet, to scale. 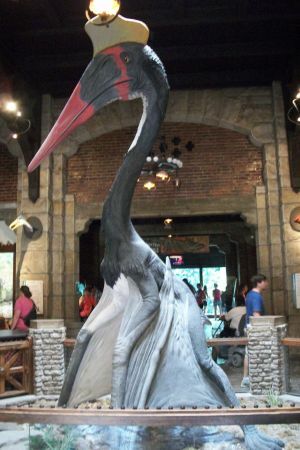 That long neck and large skull of Quetzalcoatlus would appear to make it top heavy relative to the volant stork, despite the longer wingspan. Pteranodon and other flying pterosaurs do not have such a large skull at the end of such a long neck (Fig. 1). The longer wings of pelagornis show what is typical for a giant volant tetrapod, and Q. sp. comes up short in comparison.Today we’ll compare the wingspan of the largest Quetzalcoatlus to the largest and more typical Pteranodon species (Fig. 2). pterosaur workers refuse to consider taxa known to be flightless, like SOS 2428 (Peters 2018). It’s easy to see why they would be flightless (Fig. 3). Scaled to similar snout/vent lengths with a fully volant pterosaur like n42 (BSPG 1911 I 31) the wing length and chord are both much smaller in the flightless form. Figure 3. Lateral, ventral and dorsal views of the flightless SoS 2428 (Peters 2018) alongside No. 42, a volant sister taxon. SMNK PAL 1136, to the largest Pteranodon (chimaera of largest skull with largest post-crania in Fig. 4) shows that large flyers have elongate distal phalanges, distinct from body and wing proportions documented in the largest azhdarchids, like Quetzalcoatlus. Figure 4. Largest Pteranodon to scale with largest ornithocheirid, SMNS PAL 1136. Note the long distant wing phalanges on both of these giant flyers. This is what pterosaurs evolve to if they want to continue flying. And this is how big they can get and still fly. Giant azhdarchids exceed all the parameters without having elongate wings. Note: the one on the left has a longer wingspan whir the one on the right has a more massive torso and skull together with more massive proximal wing bones and pectoral girdle. On both the free fingers are tiny, parallel oriented laterally and slightly tucked beneath the big knuckle of the wing finger. The pteroid points directly at the deltopectoral crest. (Fig. 4) demonstrate, as flying pterosaurs get larger, they retain elongate distal wing phalanges. And big, robust phalanges they are. there is a large size bump after n42 (BSPG 1911 I 31) the fourth wing phalanx either disappears (see Microtuban and Jidapterus) or shrinks to a vestige. Then there’s Zhejiangopterus (Fig. 5), with a big pelvis, gracile forelimbs and a giant skull on a very long neck. Just that neck alone creates such a long lever arm that the pterosaur is incapable of maintaining a center of balance over or near the shoulder joints. Figure 5. There are several specimens of Zhejiangopterus. The two pictured in figure 2 are the two smallest above at left. Also shown is a hypothetical hatchling, 1/8 the size of the largest specimen. As mentioned earlier, becoming flightless permitted, nay, freed azhdarchid pterosaurs to attain great size. They no longer had to maintain proportions that were flightworthy. Instead they used their shortened strut-like forelimbs to maintain a stable platform in deeper waters. And when they had to move in a hurry, their wings could still provide a tremendous amount of flurry and thrust (Fig. 6) for a speedy getaway. some specimens of Nyctosaurus (UNSM 93000, Fig. 7) also have but three wing phalanges, but they are all robust. The distal one is likely the fourth one because it remains curved. Phalanges 2 and 3 appear to have merged, or one of those was lost. Compare that specimen to a more primitive Nyctosaurus FHSM VP 2148 with four robust wing phalanges. Figure 5. Cast of the UNSM 93000 specimen of Nyctosaurus. Missing parts are modeled here. Peters D 2018. First flightless pterosaur (not peer-reviewed). PDF online. and the abstract booklet is out. So it’s time to take a look at some of the news coming out of that Los Angeles pterosaur symposium. Since the purpose of the symposium is increase understanding of pterosaurs, I hope this small contribution helps. Figure 1. The Erlianhaote specimen attributed by Hone and Xu 2018 to the clade Istiodactylidae (within Ornithocheiridae) nests in the LPT with the large derived pterodactylids. Note the un-warped deltopectoral crest and lack of a deep cristospine, along with the long legs and short wings. Figure 2. The Erlianhaote specimen nests with these pterodactylids in the LPT, not with Istiodactylus (Fig. 3). Note the antorbital fenestra becomes longer with larger size in this clade. The teeth are similar to those in istiodactylids. (Fig. 2) and added to the large pterosaur tree (LPT, 233 taxa, not yet updated due to no museum number nor genus name) the young ‘istiodactylid’ nests as a large derived pterodactylid. 13 steps separate this taxon from the Istiodactylus clade. like Istiodactylus (Figs. 3, 4) and the SMNL PAL 1136 specimen (Fig. 5), share a very large wing finger, a short metacarpus, a warped deltopectoral crest, small free fingers and deeply keeled sternal complex not found in the Erlianhote specimen. Figure 3. Istiodactylus has a shorter neck, longer wing finger and deep cristospine, among other traits not found in the new Erlianhaote specimen. Figure 4. Istiodactylus sinensis is an istiodactylid from China sharing few traits with the new Erlianhaote specimen. Note the warped deltopectoral crest not warped in the new specimen. Manual 4.1 is shorter than in other well-known istiodactylids. Figure 5. The unnamed largest ornithocheirid, SMNK PAL 1136, nests with Istiodactylus. Figure 6. The Erlianhaote pterodactylid reconstructed in several views. The imagined (gray) areas of the skull here were imagined as an istiodactylid, but the better restoration is shown in figure 2. It’s better not to eyeball certain specimens. Sometimes you have to run them through a phylogenetic analysis to find out what they are. That’s what the LPT is for. It minimizes taxon exclusion and handles convergence. So they follow lepidosaur fusion patterns, which follow phylogeny. Hone and Xu made the mistake of imagining pterosaurs might have archosaur fusion patterns that follow ontogeny. Why am I not at Flugsaurier 2018? In addition to about a dozen reasons that I can list later, or your can guess now, I can be more helpful and timely here. Andres B and Ji Q 2006. A new species of Istiodactylus (Pterosauria, Pterodactyloidea) from the Lower Cretaceous of Liaoning, China. Journal of Vertebrate Paleontology, 26: 70-78. Bowerbank JS 1846. On a new species of pterodactyl found in the Upper Chalk of Kent P. giganteus). Quarterly Journal of the Geological Society 2: 7–9. Bowerbank JS 1851. On the pterodactyles of the Chalk Formation. Proceedings of the Zoological Society, London, pp. 14–20 and Annals of the Magazine of Natural History (2) 10: 372–378. Bowerbank JS 1852. On the pterodactyles of the Chalk Formation. Reports from the British Association for the Advancement of Science (1851): 55. Hone DWE and Xu 2018. An unusual and nearly complete young istiodactylid from the Yixian Formation, China. Flugsaurier 2018: the 6th International Symposium on Pterosaurs. Los Angeles, USA. Abstracts: 53–56. as the animators at the National History Museum (NHM) in London assembled their version of the ornithocheirid pterosaur, Anhanguera, bipedally (Fig. 1), as you’ll see when you click on the video under ‘References’. Figure 1. Animated by the NHM, Anhanguera is bipedal and flapping its literally oversize wings standing on oversize feet with an undersized skull and hyperextended elbows and unbalanced stance. Figure 2. NHM Anhanguera compared to skeletal image from ReptileEvolution.com. There are at least 10 inaccuracies here. See text for list. to the invalid and dangerous quad launch, when (doggone it!) it was all set up to do a more correct and much safer bird-like launch. The laws of physics and biomechanics are ignored here, but at least David Attenborough narrates. Figure 3. NHM Anhanguera quad launch select frames. The laws of physics and the limitations of biomechanics are ignored here. that the quad-launch hypothesis cheats morphology and physics (as recounted here and at links therein) have so far failed. But I’m not giving up. So, if anyone has a connection to the NHM in London, please make this post available to alert them of their accidental foray into wishful thinking and inaccurate morphology. we looked at the neck and skull of Azhdarcho… Today we’ll put all the bits and pieces we know (from several individuals, unfortunately) to see what we get, following the Q. sp. bauplan (Fig. 1). Figure 1. Azhdarcho to scale with more complete smaller Quetzalcoatlus specimen and in proportion to the bauplan of Q. sp. Note the robust femur and gracile humerus. These together with the small sternal complex and short distal wing elements indicate a flightless condition. Azhdarcho lancicollis (Nesov 1984, Averianov 2010) is the namesake for the clade Azhdarchidae. This species is known from several individuals of various sizes and very few complete bones. That is why reconstructions of this genus are rare. This reconstruction is based on the more complete Q. sp., but about half as tall. (no complete long bones), the femur appears to be more robust than in other azhdarchids, while the humerus is more gracile. Only in Huanhepterus is the femur so relatively short. The sternal complex is quite small, but with a deep cristospine, distinct from other azhdarchids. (Perhaps the rest of the sternal complex is missing.) Manual 4.4 was identified by Averianov, but it appears to be the distal portion of m4.3. The scale bars for the distal femur appear to be in error, or apply to a much larger individual (see Fig. 1). is the observation that in nearly all post-Huanhepterus azhdarchids, the metacarpus, manual digit 4 and tibia are similar in length (Fig. 1), no matter how small or tall… probably to facilitate terrestrial locomotion. not enough is known of Azhdarcho to add it to the LRT. So much has to be imagined. Averianov AO 2010. The osteology of Azhdarcho lancicollis Nessov, 1984 (Pterosauria, Azhdarchidae) from the Late Cretaceous of Uzbekistan. Proceedings of the Zoological Institute of the Russian Academy of Sciences, 314(3): 246-317. Nesov LA 1984. Upper Cretaceous pterosaurs and birds from Central Asia. Archived 17 March 2012 at the Wayback Machine. Paleontologicheskii Zhurnal, 1984(1), 47-57.
especially when it comes to pterosaurs in museum exhibits. To wit: The Field Museum (Chicago, IL, USA) is installing a flying Quetzalcoatlus (Fig. 3) and a standing Quetzalcoatlus (largely imagined and restored, based on an almost complete wing bone, Fig. 1). Figure 1. Field Museum Quetzalcoatlus (tan) vs. English Quetzalcoatlus (gray) vs. a tracing of the real Q. sp. and Q. northropi scant remains. Yes, the skull on the Field Musuem model is too long, evidently following the invalid archosaur hypothesis of origin. Pterosaurs, like other tritosaurs, do not change their proportions during growth as fossils demonstrate. of a recent post on flightless giant pterosaurs. The Field Museum model (Fig. 1) appears to have a more precisely modeled skull, though about 50% too long (but really, without a skull, who knows?). Perhaps the skull was elongated (based on the smaller ?species) based on the invalid archosaur hypothesis of pterosaur origins. We know from the evidence of fossils that hatchlings and juvenile pterosaurs had adult proportions, not longer skulls. from putting too much weight on the tiny free fingers. The feet should be beneath the shoulder joint, as in birds, to take the weight off the tiny hyperextended fingers, acting more like ski poles, not providing thrust, only some sort of support. (Fig. 2), but it shows in both models. The wing finger should flex closer to the elbow, but it doesn’t (probably to let the wing membrane show). The wing membrane chord should be shorter, to the elbow, but in both models the brachiopatagium blends with the leg, always awkwardly and in defiance of the data preserved in all pterosaur fossils (Fig. 2) that preserve soft tissue. Figure 2. Here’s how the wing membrane in pterosaurs virtually disappeared when folded. This is a tiny pre-azhdarchid, CM 11426.
they have a tiny pre-azhdarchid, CM 11426 (Fig. 2), with real wing membranes, as described above, matching those of other pterosaur soft tissues. Figure 3. Field museum flying Quetzalcoatlus model has the traditional but invalid deep chord wing that attaches to the tibia and makes this sort of pterosaur untenably awkward. Figure 4. Quetzalcoatlus recreated as a digital model by Henderson 2010 compared to a bone reconstruction. This is a possible slightly deeper wing chord. Compare this one to figure 5, which is more typical. And look at those hind limbs, like those of Sharovipteryx, forming a horizontal stabilizer, just like a typical airplane. And it matches the evidence (Fig. 2). keep insisting that evidence (Fig. 2) can and should be ignored. It’s disheartening to see this and leaves them open to criticism. Figure 5. 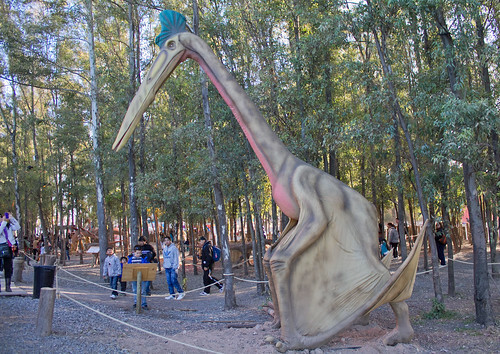 Quetzalcoatlus running like a lizard prior to takeoff. Click to animate. Giant azhdarchids gave up flying by reducing the lenth of their wings, following the patterns of other flightless pterosaurs. There is no awkwardness with this narrow chord wing design, which follows fossils like CM 11426 (Fig. 2). a too far aft center of lift and a too far forward center of balance, or too small of a wing for such a large mass, no worries mate! If the imagination can soar, then so can these giants (NOT!) In the above YouTube video, the invalid, but traditional batwing shape of the brachiopatagium is best seen in the pterosaur’s shadow. awkward, liable to trip up the pterosaur or catch on some low lying shrub, no worried, mate! As these pterosaurs once wandered, let your imagination wander. There’s no need to precisely follow the evidence (Fig. 2) that shows the wing membranes essentially disappearing while flexed/folded. given some of these awkward quadrupedal poses. Much better to have the center of balance over the toes at all static times (see below), shifting the balance forward while running at full speed (Fig. 5), like birds. Why is this Houston Museum Quetzalcoatlus posed like this? Very strange. Quetzalcoatlus neck poses from David Peters Studio. Dipping, watching and displaying. Yes, the third finger is wrong here. It should be pointing posteriorly. this should be a golden age of restoration. Instead, these models will someday be seen for what they are… near misses. They replace elegance with awkwardness, facts with fancy, and precision with tradition. reviewed views on pterosaur posture (Fig.1 ) from the Witmer et al. 2003 paper on pterosaur brains and ‘smart’ wings. Unfortunately, Unwin illustrated his Nature review with freehand illustrations from Wellnhofer 1991 (Fig. 1) that bear little resemblance to traced bone sizes and proportions. And no one raised a finger in protest. Figure 1. Images from Unwin 2003 compared to fossil tracings and reconstructions from ReptileEvolution.com. Dashed line above toes in Rhamphorhynchus indicates center of balance, below the wing root, as in birds. Note the imaginative illustrations Unwin uses with little to no basis in reality. The skulls display the appropriate rostral tilt. Inaccuracies are permitted for some workers. Some have license to misrepresent, to advance bogus concepts, and to omit taxa. Then again, mistakes do happen. If so when were these mistakes (Fig. 1) noted and corrected by pterosaur workers over the past 15 years? After all… this is science and accuracy should be paramount. Fact should not be confused with fantasy. have advanced competing hypotheses and reconstructions, but I rarely if ever, have seen them specifically criticizing competing hypotheses and reconstructions. (Send examples or citations of this if you have them.) Instead, pterosaur workers seem to avoid criticizing the work of colleagues, leaving that to bloggers. Unwin is of the mind set that pterosaurs were dinosaur relatives — but gave Rhamphorhynchus a sprawling, lizard-like posture (Fig. 1), with fingers pointing anteriorly. I gave Rhamphorhynchus an erect posture in the knowledge that some lepidosaurs were occasional bipeds while others, like Sharovipteryx (Fig. 2), Longisquama and Bergamodactylus, did not employ their forelimbs at all during terrestrial locomotion. Figure 2. Cosesaurus was experimenting with a bipedal configuration according to matching Rotodactylus tracks and a coracoid shape similar to those of flapping tetrapods. Long-legged Sharovipteryx was fully committed to a bipedal configuration. Back to the abstract of Witmer et al. 2003. Witmer LM, Chatterjee S, Franzosa J. and Rowe T 2003. Neuroanatomy of flying reptiles and implications for flight, posture and behavior. Nature 425, 950–953.